The Bus Depot got its roots nearly two decades ago, in my driveway among the rolling hills of rural Pennsylvania. It was there that I brought my first VW home - a '71 camper, which was a little "rough" to put it kindly. As I fixed it up, I discovered how hard it was to find certain parts locally, especially at prices I could afford. So in no time, two campers were in my driveway - my daily driver, and a "parts" bus salvaged from a local farm. The two busses in my driveway attracted other local bus owners, who would stop in to chat when I was working on them. It seemed that everyone shared my frustration with many parts being either elusive or expensive. 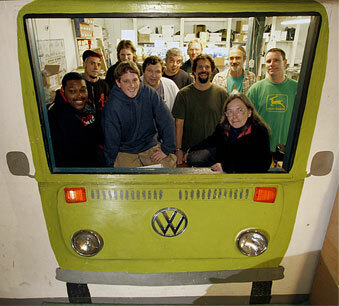 The VW was meant to be affordable - the "people's car." So why were some parts prices so high? It just didn't make sense to me. I was a buyer for a retail chain, in a field where the average profit margins are a fraction of what they are on auto parts. Yet they still made money. How? They learned to live lean. They cut overhead every way possible and passed the savings on to their customers, because in their business, they had to. Meanwhile, VW parts suppliers were raking in 50 or 60 percent markups as if they had no choice.. and often providing questionable quality even at those prices. I thought I could do it better and cheaper, using a relatively new invention called the Internet, rather than spending a fortune on advertising and trying to recoup those expenses with high prices. No glossy catalogs, no fancy ads, just a online store for Volkswagen enthusiasts just like me. So, I started the Bus Depot in my basement with a few hundred bucks, a coat closet full of parts, a homemade website, and a simple mission that to this day governs everything we sell - "Better Parts, Better Prices." Well, it just took off! With the loyal support of local VW clubs and the growing Internet community, plus a handful of dedicated VW enthusiasts who climbed on board for the ride, we became the world's first VW parts "dot-com." Today we sell literally hundreds of thousands of parts from all over the world, and are the leading online VW van parts specialist. And the reason is still the same: No-nonsense, rock-bottom prices on quality parts - sold by VW enthusiasts to VW enthusiasts. So, that's the Bus Depot story. Thanks to the much-appreciated support of VW owners like you, our Volkswagen hobby has turned into a real business - saving you money on quality parts and supporting your Volkswagen hobby! We love what we do. We hope you will as well.